The Ukrainian Museum is delighted to announce that it will open the exhibition "Andy Warhol: Endangered Species" to the public on Sunday, Oct. 7. 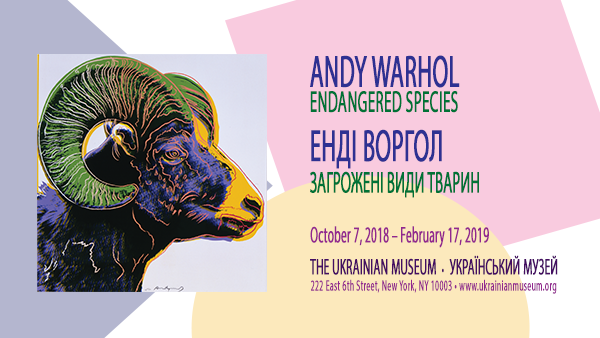 Commemorating the 90th anniversary of the birth of Andy Warhol (1928-1987), this is the first Warhol exhibition ever organized by a Ukrainian American organization. "Endangered Species" is on loan from the National Museum of Wildlife Art in Jackson, Wyo. James Warhola, an artist, writer, book illustrator and nephew of Andy Warhol, is a special contributor to the displays in the exhibition. The exhibition includes the 10 silkscreens in the "Andy Warhol: Endangered Species" series from 1983 — Bighorn Ram, Black Rhinoceros, Grevy's Zebra, Orangutan, San Francisco Silverspot, African Elephant, Bald Eagle, Siberian Tiger, Pine Barrens Tree Frog, and Giant Panda — as well as the silkscreen Sea Turtle (1985). An important component of the show at The Ukrainian Museum will be a section dedicated to Andy Warhol's early years growing up in Pittsburgh. At the vanguard of the Pop Art movement, Warhol is recognized as one of its greatest architects. But the influences from his youth, when he was immersed in the culture of his Carpatho-Rusyn origins, impacted his evolution into a world-renowned artist. This exhibition not only features the still relevant "Endangered Species" series, but also looks at Warhol's heritage and other inspirations from his early years that spurred him along the path toward becoming one of the most influential American artists. Augmenting the "Endangered Species" exhibition are several early drawings by Warhol, as well as a few personal artifacts and family photo prints. The Ukrainian Museum is located at 222 E. Sixth St. between Second Avenue and Cooper Square. Museum hours: Wednesday-Sunday, 11:30 a.m. to 5 p.m.
"Andy Warhol: Endangered Species" will be on view through Feb. 17. One of my old Columbia Univ mates, Alexander Motyl, will be MC at the event. He's written many books about the Ukrainian Lower East Side and always does something for the Ukrainian Museum. Hope we can meet up that day.